Individuals and entities enter into a variety of transactions for the purchase and sale of goods. Unfortunately, these transactions are not always successful. In that case the parties involved have several remedies available to them under two broad categories—monetary damages and equitable relief. In cases of failed transactions where one party has breached duties under the contract, the non-breaching party may seek “specific performance” as an equitable remedy. To qualify for this type of remedy, the party seeking specific performance must show, among other factors, that a remedy at law would be inadequate. In other words, the party must demonstrate that no reasonable amount of money will rectify the other party’s breach under the contract. So, another form of remedy is necessary. This usually comes up in cases dealing with the purchase or sale of a unique good—for example, real estate. Moreover, in transactions dealing with a single-family dwelling, this presumption is conclusive. (Cal. Civ. Code, § 3387.) This means the presumption is final—the party seeking specific performance does not have to prove the real property was unique and the party opposing specific performance cannot argue the real property was not unique. In cases dealing with all other real property, this presumption affects the burden of proof. (Cal. Civ. Code, § 3387.) So, the burden shifts to the party defending against specific performance to demonstrate that monetary damages would be an adequate remedy. A party can overcome this presumption by demonstrating that the party seeking specific performance intended to sell the property rather than occupy it. (Jessen, supra, 142 Cal.App.3d at 458.) Here, money damages would prove an adequate remedy. 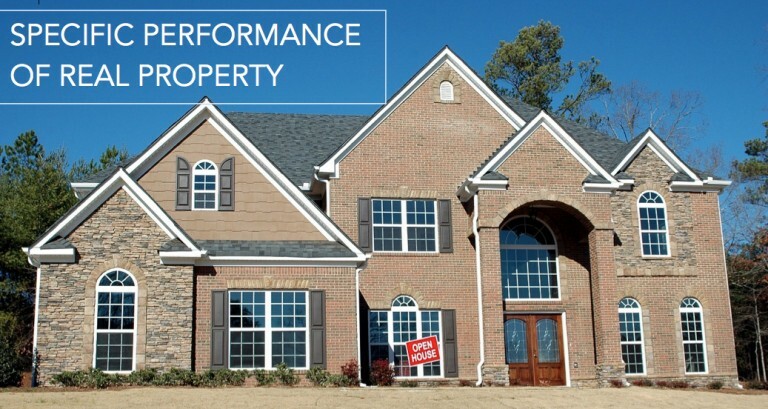 In any case, courts are unlikely to compel specific performance against a buyer of real property. (Tropico Land & Improvement Co. v. Lambourn (1915) 170 Cal. 33, 38–39.) Courts recognize that buyers have to overcome several obstacles to purchase real property, including qualifying for a loan, securing a down payment, and even selling a current residence. On the other hand, typically, a seller only needs to transfer title to the property. Courts will not compel specific performance against a party who could not perform. If you are a party to a real property transaction, you may contact us to speak with an attorney regarding the remedies available to you in case of a breach. You can send us a message through our Contact Form, email us at info@schorr-law.com, or give us a call at (310) 954-1877. You can also text us at (323) 487- 7533.